Sunday was another memorable day in a career full of them for LeBron James. He led the Cavaliers to a 105-101 victory over the Pacers in Game 7 of their first round series, with 45 points, nine rebounds and seven assists. It was the second most points by a player in a Game 7 in NBA history. LeBron James' 45 points is the 2nd-most in a Game 7 win in playoff history. The fact that the Cavaliers survived their series with the Pacers, is a true testament to LeBron’s greatness. 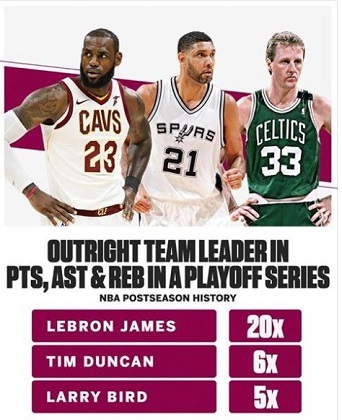 It was the first time in his career that he has ever won a playoff series where no other player on his team scored 20 points in a single-game, oh and for more proof of James’s greatness feast on this stat. LeBron also had four steals in Game 7 and is now the steals leader in NBA Playoff history, passing Scottie Pippen. His next test will be even tougher as the Cavaliers take on the top-seeded, 59-win Toronto Raptors in round two. It will be the first time the Cavaliers have been an underdog in an eastern conference playoffs series since his return to Cleveland in 2014.